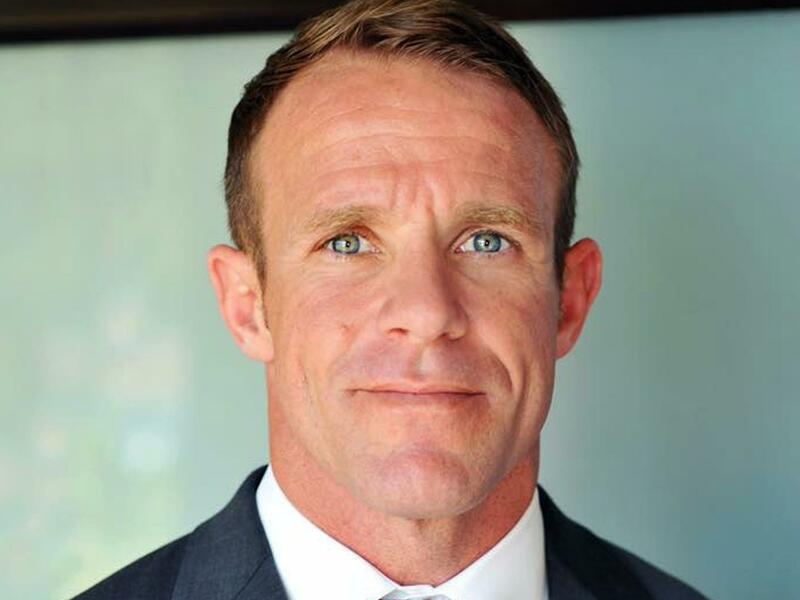 This 2018 photo provided by Andrea Gallagher shows her husband, Navy SEAL Edward Gallagher. Gallagher is facing charges of premeditated murder and other offenses in connection with the fatal stabbing of a teenage Islamic State prisoner under his care in Iraq in 2017 and the shooting of unarmed Iraqi civilians. His attorney says he will plead not guilty to all the charges at a naval hearing Friday. "I got him with my hunting knife"
According to the charge sheet, Gallagher is accused of committing premeditated murder against the wounded teen by "stabbing him in the neck and body with a knife." At a November preliminary hearing, prosecutors elaborated: After Iraqis called in an airstrike on a building, they captured a wounded ISIS fighter who was about 15 years old, Naval Criminal Investigative Service Special Agent Joe Warpinski told the court, according to the military trade publication Task & Purpose. The Iraqis turned the fighter over to the Navy SEALs, and medics began treating him for shrapnel in his left leg and difficulty breathing. Gallagher then completed his re-enlistment ceremony next to the body, prosecutors allege. Later, Gallagher allegedly texted one of the photos to a fellow SEAL, along with the text: "I got him with my hunting knife." Prosecutors say there were three eyewitnesses, according to Task & Purpose. Gallagher's attorney told the court the teen died from injuries from the airstrike, despite Gallagher's attempt to save him, the AP reported. "Does the public still believe we are the good guys, because Chief Gallagher decided to act like the monster the terrorists accuse us of being?" Czaplak said. "He handed ISIS propaganda manna from heaven. His actions are everything ISIS says we are." "This is not who Eddie is," his wife, Andrea Gallagher, told the Times in November. "He is a lifesaver. He is that guy who runs into the burning building when other people are running out." Stackhouse previously told NBC that witnesses provided conflicting statements, and that "if we are allowed to present our case, at the end of the day, Eddie will be acquitted of the charges." In November Stackhouse told the Times that the SEALs who made the allegations against Gallagher were disgruntled because they couldn't meet his demanding standards. "I promise you, we will call many more SEALs who will say none of this ever happened," Stackhouse said. In December, Stackhouse told Fox News he would "very much appreciate the president taking a look at Eddie Gallagher's case."